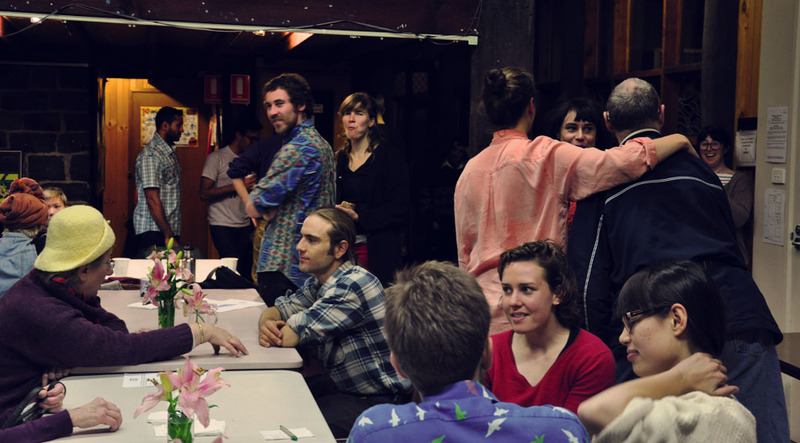 Over the last 6 weeks a pilot for a project named ‘Open Table‘ has been brewing in Brunswick. Open Table has been schemed up by five RMIT University students and alumni from a variety of backgrounds (Social Work, Landscape Architecture, Industrial Design, Sustainability, and Economics) focused around food redistribution and community connectedness. To do this they have been holding weekly Sunday dinners at the Brunswick Neighbourhood house, using excess food that would otherwise go to waste. Over the series of dinners they have made friends with neighbours in supported living and community housing in Brunswick, and extend special welcome to people often excluded in local activities. The dinners are inclusive, accessible and free. I made it along last week for the final of the six week pilot and had a good feed and chat. From this Sunday 2 June they will launch the first in a permanent series of monthly dinner parties. On the first Sunday of every month at the Brunswick Neighbourhood House, De Carle St, Open Table will welcome friends, families, neighbours and anyone up for a free Sunday feast. Check them out on web, facebook and get on down in person this Sunday if you’re round Brunswick way.